The Indian government today appointed Swaminathan Gurumurthy and Satish Kashinath Marathe as part time directors of the Reserve Bank of India (RBI) board for a 4 year term. Gurumurthy is the editor of Tamil political weekly Thuglak and the co-convenor of Rashtriya Swayamsevak Sangh (RSS)-affiliate political and cultural organization, Swadeshi Jagaran Manch, and Satish Marathe is a business man and the patron of an NGO called Sahakar Bharati which is furthering the co-operative movement in India. 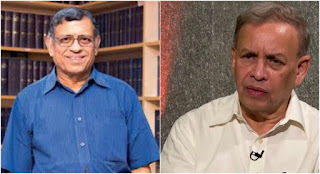 Both the names were approved as per provisions of Section 8 1C of the RBI Act, 1934 by Prime Minister Narendra Modi-led Appointments Committee of the Cabinet after a proposal from the department of financial services. With the two appointments, RBI’s board now has 10 government-appointed members. This is the maximum number of members permitted.